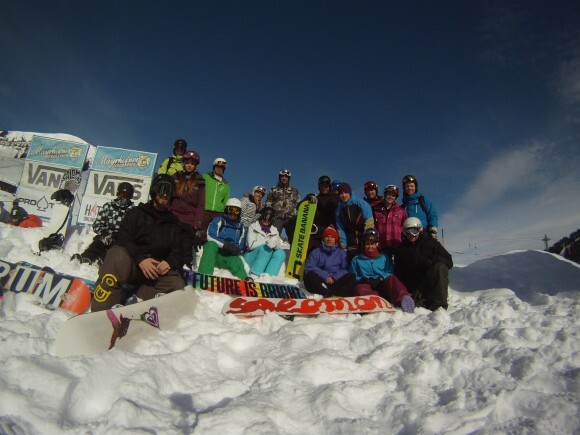 Definition will be back out in Mayrhofen for a week of snowboard performance, snowboard freestyle coaching & Ski Performance coaching, Ski freestyle coaching on the 23-30 March 2013. We are now only taking coaching only option on the March camp. 7 nights stay in a fully catered Chalet, including breakfast and three course evening meal!! The accommodation is on a shared room basis in the heart of Mayrhofen so a short walk to the lifts and pubs. The flights, transfers and accommodation are booked through a tour operator and is ATOL protected. Here is a picture of our January Snowboard camp.